Nigeria’s male barbie, Bobrisky has called out former Big Brother housemate, Kemen who was disqualified from the house last Sunday for sexually harrasing TBoss. His reason for calling out Kemen was because he told TBoss while in the houe that he doesn’t like Bobrisky. Dis will be a lesson for other people, never wish anyone bad. 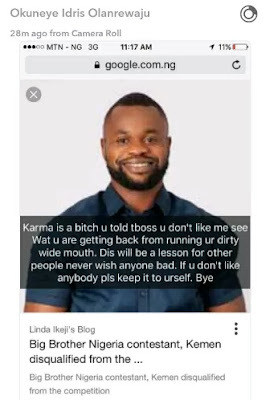 0 Comment to ""Karma is a b*tch" Bobriskyy calls out Kemen"